Okay. Be prepared for this, it may make you cry, I write ‘may’ because there is a chance you are an internet connected washing machine or something. 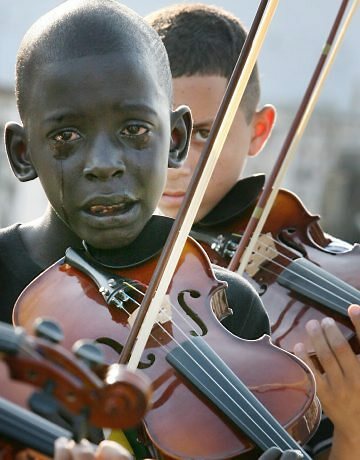 The other day I chanced upon this image with the caption ‘a 12 year old boy plays violin at the funeral of his mentor, who helped him escape poverty and violence through music’. Because I am not a washing machine this was enough to move me, the story within that sentence and the photo of the young boy’s tears, brought a lump to my fabric softener drawer. But then I decided to look into the story further. I found out that his mentor was Evandro Joao da Silva, a man who co-ordinated a hopeful charity group called Afroreggae that encourages young people from all over Brazil to take part in activities such as football, music and capoeira to help avoid their descent into the world of drug-trafficking. It is heartening to know there are people like this in the world, people struggling to fight the encroaching shadows with whatever light they can generate, whatever love they can muster against the vast indifference of a cruel world. But this inspiring man, Evandro, was murdered in a robbery in Rio in October 2009. The footage shows two men approaching Evandro and throwing him to the ground before shooting him. They then proceed to remove his jacket and flee the scene. A military police car then passes the scene, with a full view of Evandro lying on the ground. The officers do not assist Evandro but chase the thieves. On catching them, they do not arrest them but let them go. The footage shows one of the thieves walking away just a few minutes later and afterwards, one of the officers putting Evandro’s belongings into the police car. The police drive off, and Evandro is left to bleed to death. So there you have it, a tragic and terrible story, a dark stone flecked with golden slivers of the hope and kindness of people pitted against the grinding and constant gloom of greed and poverty. Upsetting, right? Within a year of playing the violin and weeping at the funeral of his murdered mentor, Diego was diagnosed with Leukemia. This came shortly after his mother was diagnosed with an inoperable brain tumour. Diego died aged 12 after slipping into a coma and an unsuccessful operation. Here, at his funeral, his friends, other children from the Afroreggae program, play a final homage to him – the song Asa Branca. What is the world, with all its indignity and suffering? There are not words fit to say. But there is, at least, music that tenderly, furiously, fills the abject silence. 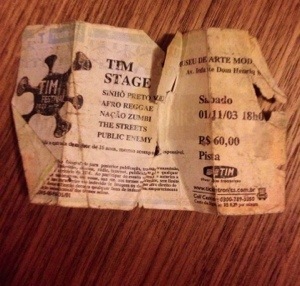 Epilogue: I was going through a box of personal items the other day when I came upon a ticket from 2003, when I was working in International Politics and had been sent to Brazil. I was able to take a few days in Rio as holiday and while there I went to see Public Enemy (and the Streets) play live, I remember very much enjoying the other Brazillian bands I saw supporting them, one of which was Afro Reggae.